Metro Bike Share dock at Wilshire/Vermont Metro station - photo by Joe Linton/Streetsblog L.A.
Metro Bike Share docks have arrived in L.A.’s most population-dense neighborhood: Koreatown. Koreatown has just two docks so far. The dock pictured above is at the Metro Red/Purple Line Wilshire/Vermont station. It is located back behind the station – on Shatto Place, just north of Wilshire Boulevard. From the Metro Bike Share website map today, there is one other K-town station on the south side of 8th Street, just west of Vermont Avenue. Map of current Metro Bike Share docks in central L.A.
Two bike-share stations does not a functional network make, but it is good to see the system expansion underway. 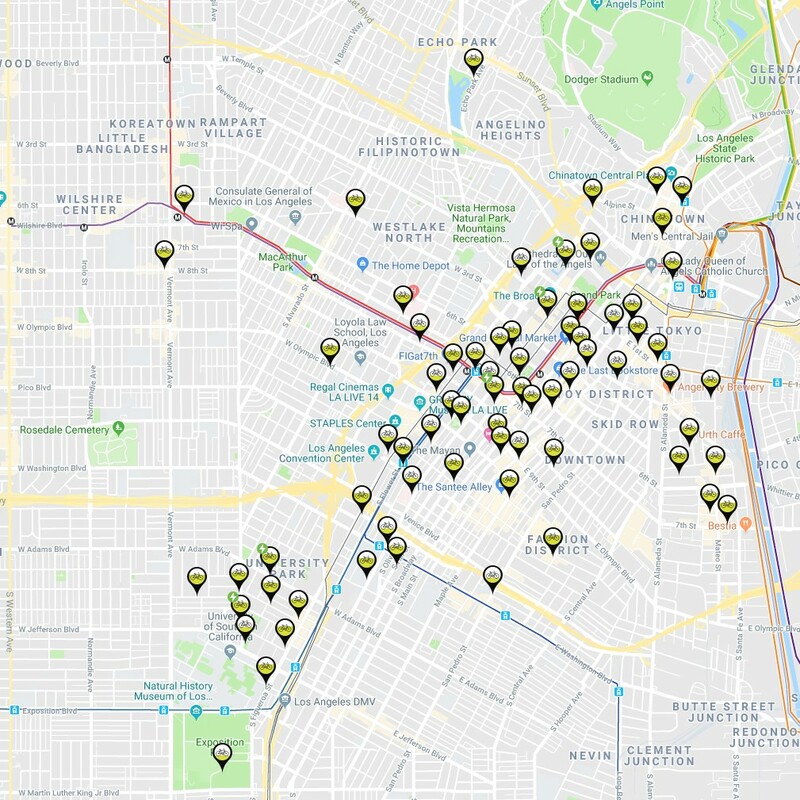 In the near term, Metro Bike Share is approved to expand throughout the areas just west of downtown L.A., including MacArthur Park, Pico-Union, Koreatown, East Hollywood, Silver Lake, and Echo Park. It will also land in North Hollywood and expand on the Westside. Super! Now what is the status of the SGV Dock-optional Bike share that Metro presented to SGVCOG? Do you have details on what Metro presented to SGVCOG. It seemed SGVCOG was thinking of working with some other providers but then decided to reject all their bids.